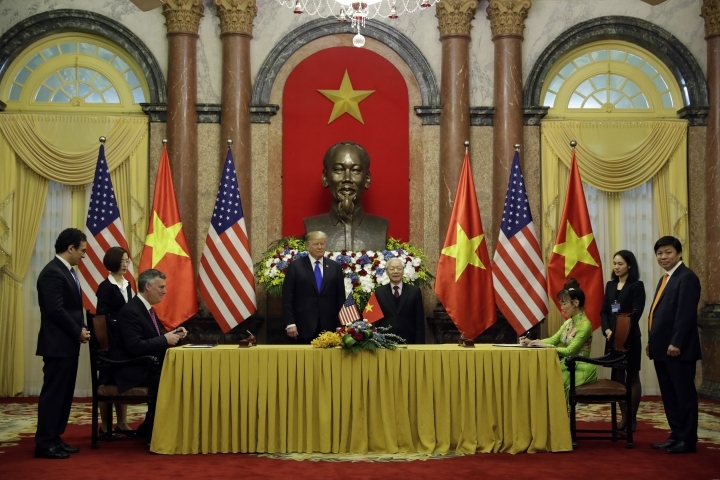 HANOI, Vietnam — President Donald Trump and Vietnamese President Nguyen Phu Trong presided over the signing of several trade deals in Hanoi on Wednesday, including agreements to sell the booming Southeast Asian country 110 Boeing planes worth billions of dollars. The deals give Trump a tangible economic win ahead of meetings expected for later in the day with North Korean leader Kim Jong Un in the Vietnamese capital. Those talks , which follow an initial summit in Singapore last year, are focused on North Korea's pursuit of nuclear weapons and seeking peace on the Korean Peninsula. Trump has downplayed the likelihood of a breakthrough at the summit. "Hopefully great things will happen later on with our meeting but a lot of good things are happening before, and that's the signing of trade deals with the United States, and we appreciate it very much," Trump told Nguyen as the trade agreements were being unveiled. In the biggest of the deals, Chicago-based aircraft manufacturer Boeing Co. said it is selling 100 of its 737 MAX planes to Vietnamese low-cost carrier Vietjet. The privately owned carrier operates domestic and regional flights using Airbus planes. Boeing and Vietjet said their deal was worth $12.7 billion at list prices. Airlines typically negotiate discounts for bulk orders. Vietjet is doubling down on its bet for the 737 MAX, which is an updated version of the workhorse single-aisle 737 model. It already had 100 of the planes on order following a 2016 deal, though none have been delivered so far. The deal marks a major confidence boost for Boeing, which has faced questions about the plane's safety since a 737 MAX 8 operated by Indonesia's Lion Air plunged into the Java Sea, killing all on board, just minutes after taking off from Jakarta on Oct. 29. Boeing sealed a second sale to Bamboo Airways of 10 787 Dreamliners, which they valued at $3 billion. The startup airline was founded in 2017 and began operating domestic flights in January. It is owned by Hanoi-based conglomerate FLC Group and already had 20 Dreamliners on offer. U.S.-based aviation technology company Sabre also inked a deal with the flag carrier Vietnam Airlines during Trump's visit. It said the memorandum of understanding has a "potential value" of $300 million. The deals follow a determination by the Federal Aviation Administration earlier this month that Vietnam now meets international standards for aviation safety. That decision, which follows an assessment by the agency in August, would allow Vietnamese airlines to fly to the United States and to cooperate with U.S. carriers. There are currently no direct flights between the two countries.